Here’s a healthy, grain-free version of a comforting Apple Pear Cobbler. The topping is made using cassava flour, with the sweetness coming from maple syrup and raisins. Back in early 2017, this Apple Pear Cobbler was happening in my house on repeat. I’m re-sharing it now since it’s such a great healthy dessert for the cold evenings we’ve been having. I recommend using whatever sweet, organic apples you can find, but I’m partial to Honeycrisp, because they are crisp and tart and pair wonderfully with the sweetness from the other ingredients. Second-runners up for me would be Fuji and Gala apple varieties. Just like my Grain-Free Berry Crumble recipe, I use cassava flour to make the topping. In case you didn’t know, cassava is a whole food! It comes from a root and is dehydrated and ground into flour. Anyway, the cobbler topping is delicate and deliciously sweet with some maple syrup. I used coconut oil in the topping to keep it vegan, but you could also use a grass-fed ghee instead of coconut oil for a more buttery, paleo version. 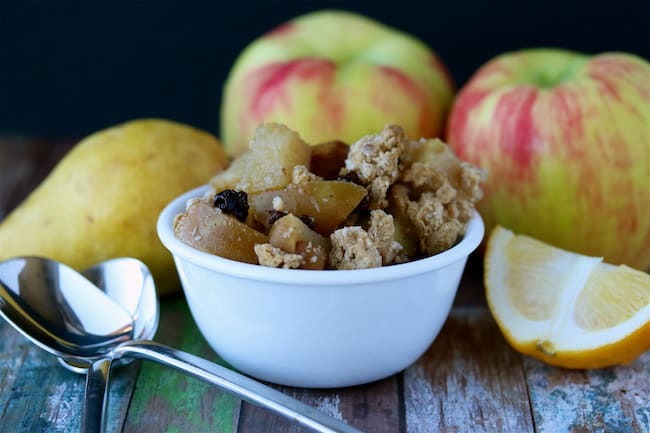 The steps to making this healthy Apple Pear Cobbler are very simple. You’ll need to preheat your oven and get a glass dish ready. Chop the apples and pears into bite-sized pieces and place in a medium mixing bowl. Stir the lemon juice and raisins with the chopped apple and pear and pour into the baking dish. Cover the baking dish with foil and place in the oven for 30 minutes. While the fruit is baking, make the crumble topping. Combine the cassava flour, baking powder, cinnamon, maple syrup, vanilla extract, and coconut oil in a medium mixing bowl. Use your fingers to mix the ingredients together to form the crumb topping. Carefully remove the baking dish from the oven and dollop the crumb topping on top. Place the baking dish back in the oven, uncovered, for another 30 minutes. Serve hot, with about 2 tablespoons of your favorite dairy-free vanilla yogurt for each serving. 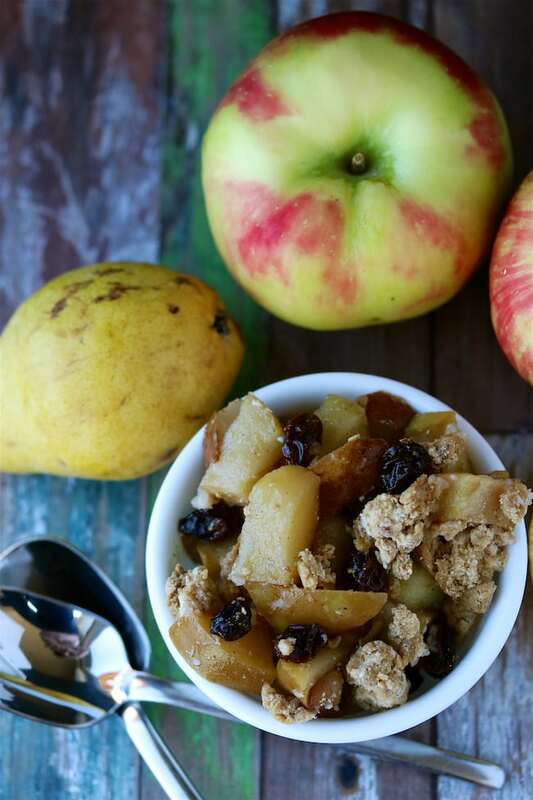 I highly suggest making this healthy cobbler while apples and pears are in season! This is a healthy, grain-free version of a comforting Apple Pear Cobbler. The topping is made using cassava flour, with the sweetness coming from maple syrup and raisins. This is a healthy dessert that everyone will love! Spray a 8”x 8” baking dish with non-stick cooking spray and set aside. 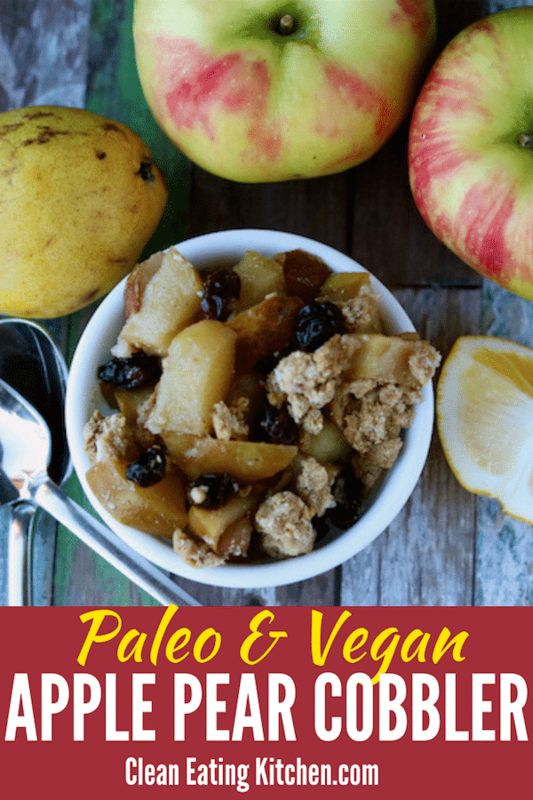 Pin this Paleo & Vegan Apple Pear Cobbler recipe to your favorite Pinterest board to save it for later! Yum! Baked apples are delicious. This looks so good Carrie! What a great dessert. I tend to go with chocolatey things and this is a good reminder to switch it up, especially since I love apples so much. I haven’t tried cassava flour – I’ll have to check it out! Thanks, Kimmy!!! The only reason I make non-chocolate desserts is so I can eat them after dinner! If chocolate didn’t keep me up at night, I’d be eating it after lunch and dinner. 🙂 See you soon for some chocolate and fun!!! XOXO. This looks so yummy! That crumble cobbler top is perfect! Oh nice, I love apple based desserts! This would be perfect! Hope you love it, Mark! Thanks! Apple cobbler is the best!! Such comfort food. Love that you added pears too, and that it doesn’t call for a ton of ingredients – super easy to make! Can’t wait to try! 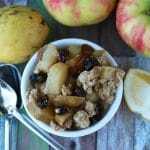 I have been looking for a good cobbler recipe and it looks like I have found it! This one is my favorite grain-free version. Thanks, Donna!!! Oh yum! I love cobbler. It works so well for a dessert or a breakfast. My relatives love staying over my house since I always make a cobbler for breakfast 🙂 Will try this one for sure! This sounds sooo tasty! I might add a dollop of coconut whipped cream on top…. mmmmhmmmm! I love fruit cobblers! I wish I had some of this delicious apple pear cobbler for dessert tonight. I wish I could send you some, Emily!!! Thanks for rating my recipe. XO. That crumbly topping looks perfect and I love the addition of raisins. What a delicious, healthy treat! Apple pear sounds like such a great combo, I’ve never tried it before! I know cobbler is supposed to be for dessert, but I love it for breakfast too! YES very interested in learning more about why you’re experimenting with grain free! Thanks, Rachel! 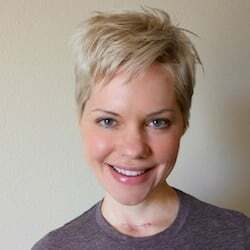 I am starting to work on a blog post with some updates on my health. Hoping to get it up in about a week. I will def be talking about the grain-free thing! XO. Love this recipe. I love apples and this gluten free version just makes it even better ! Thank you SO much!!! XO. This looks delish! The crumble looks perfect! This is what I enjoy after a big roast dinner on a Sunday evening, delicious. Glad you like this recipe, Vanessa! XOXO! What a great treat for any time of day or occasion. Thanks for sharing. Oooh I love a good cobbler! You just can’t go wrong with apples and pears – super yummy! Thanks, Georgina! Are you able to find cassava flour in the UK yet? XO! Love that there are pears in here! Such a delicious but under-rated fruit. I doubled the recipe and my family was able to pack a healthy dessert for lunches at work and school. So tasty! Ohhhhh, that makes me so happy, Erin!!! I’m so happy you liked this recipe. XOXO!! !